It’s hard to imagine there has been a single dull moment across the career on Minneapolis raised Bryan Black, aka Black Asteroid. Initially studying as a graphic designer, Black leaped from one success to another as his industrial-rock outfit Haloblack was picked up by Prince, leading to him becoming a sound designer and keyboard technician for the seminal artist. Subsequently Black also formed Motor, a project aimed at addressing techno’s increasingly formulaic sound. 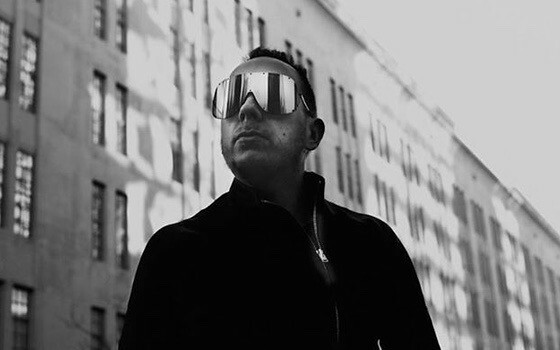 Over the last few years however he has been performing as Black Asteroid, a pursuit somewhere between the booming hedonism of CLR (a label which has been notably supportive of the project) branded techno, and the futuristic pop of ’80s new-wave and industrial scenes. I was recently hired as a keyboard tech for Prince and his band, the NPG. At the time Prince would throw impromptu live gigs during the week on the soundstage at Paisley Park in Chanhassen, Minnesota. I was standing on the side of the stage making sure the keyboards were working, the samplers were triggering the right sound banks, etc. Prince managed to break a couple of keys on one of the keyboards and looked over at me. I immediately ran to the basement and fetched a backup keyboard. As I’m making my way back to the soundstage I glance at the garage full of iconic prince cars and then near the elevator I walk past the infamous vault. As soon as I swapped out the keyboards, I proceeded to open up the broken one and replace the broken keys and get back to my job. He played for hours and hours, I think there were about 100 people there. It was a Tuesday. I was underage but somehow managed to sneak in when the bouncers weren’t looking. NIN was the support act for Peter Murphy. The first NIN LP just came out and it blew my mind. I will never forget the smell of beer and then seeing NIN trash the stage and completely upstage Peter Murphy. I met Trent briefly before the show. He had sweaty hands. My band MOTOR we signed to Mute records, and Martin Gore I found out was a fan of the singles we had released. We got approached to remix ‘Precious’ and then by chance I met Martin Gore in NYC. A few days later we were invited to open for Depeche Mode in Europe. Every show was in an outdoor football stadium, rain or shine. I never felt so nervous in my life. But the exhilaration of performing for 50,000 people and walking down Dave Gahan’s little runway into the audience will never be forgotten. Also the catering was insane. By this time the band members were clean and sober and had life coaches on the road with them. Not the rock and roll experience I had read about from previous tours, but they were super nice and accommodating. I had just finished performing as ‘MOTOR’ (my project before Black Asteroid) and made my way over to the main stage to see Daft Punk. As soon as I saw the pyramid light up I knew this was something special. Still the most captivating dance music display I have seen. My first band Haloblack had just starting gigging around town. One of Prince’s people invited us to perform at one of his dance parties at Paisley Park. I was told he wasn’t there, but later learned he was watching. After the gig, I got offered a job with Prince. Seeing Purple Rain was the catalyst for me to start making music. By the time I started working for him, he didn’t have a name, so I called him ‘Sir’.